As spring moves along, thoughts turn to summer and beaches, sea and sun. 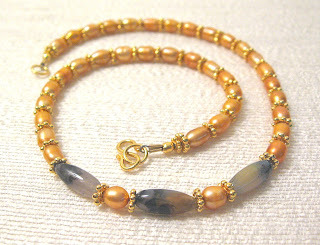 "Seaside Dawn" reflects the colors of the sea in the Montana Agate rondelles, while the Freshwater Pearls evoke the dawn. In between each pearl is a 24K Gold Vermeil "Daisy" spacer, adding a bit of shimmer. I haven't been to the beach yet, but I plan to visit Plum Island (MA) soon. Dogs are allowed to run free on the beach there, and it's a great chance for me and David to be near the ocean and my wonderful dog, Pepper, to run free and mix with other dogs.